The world of business is not thing new to me so the ins and outs of running a business with a model, any scheme is quite understood I know for sure, although it meandering like a snake circular prey. So already finish with the world, then any intention behind the business that is offered will always be easy to know, whether it is impersonating the class of little fish until that is really pure business. A few weeks ago, suddenly I got an offer business OG1 asean from colleagues. At first I did not bother with the offer and it was going to throw up, but my curiosity began to tickle so inevitably I was trying to find out the trivial business that my friend offered. Business offered it sound trivial, mock-ups and low class that may be synchronized with the sale and purchase of chicken in the market especially if not a business credit. But what makes me suddenly shocked and amazed is the price offered OG1 Asean, very skewed out of the ordinary, as in the kiosks retailers pulse. Imagine if we usually buy 10 pulses with the price of approximately Rp. 12.000 then in this business pulse 10 can be purchased in the range Rp.8.500. Also pulse 20, which is usually offered Rp.22.000, then enough to spend Rp.17.000 we can get. Pulse 50, enough with Rp. 36.000 we can enjoy. Not much different with the electrical token, the average price difference token 20. 50. 100. 200 on the market is always on sale over the nominal value of the token itself. 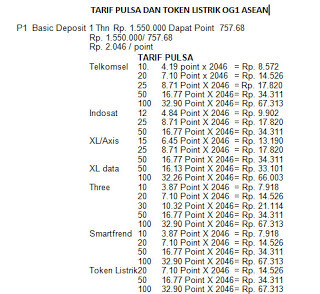 Example token 20 costs Rp.22.000, token 50 (Rp.55.000). But in this business, the price offered super cheap is exactly the same as the price of mobile phone pulse as I told you earlier. Being a big question mark for all of us, why is the pulse so cheap to sell? see the reviews continue to the end of this paper. Well, here lies the uniqueness of this OG1 Asean business, given that the products offered in the group of primary needs. This means that until this moment, any human on the face of the earth will always need a name pulse, with a note as long as the cell phone is still there and electricity is still used as a home lighting equipment. To me this is a spiriular business, which makes the forehead creased so that suspicions begin to creep inwardly. Perhaps this is a new style of deceit-tricking under the guise of a dumb investment. Search begins with a list of blacklisted companies in the financial services authority. The result, as released in http://bisnis.liputan6.com it was not found that the company was on the block list of the Indonesian Financial Services Authority. Satisfied with the results of the initial investigation, slowly but surely, the confidence in my heart began to gradually rise. My attention began to be directed to the company profile because supposedly said Telkomsel Malaysia company namely PT. Telin has cooperated with PT Kilauan Padu Malaysia.Sdn.Bhd to run the business of this credit. 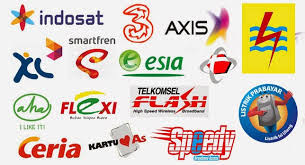 That is true, can be listened in the news uploaded on the official website telkomsel malaysia http://www.telin.com. This means that pulses sold in Indonesia since April 2017 are Malaysian Telkomsel products so that the price is super cheap compared to the price of Indonesian red plate company (Telkomsel Indonesia). This is one proof, after the agreement of AFTA (Asean Free Trade Area) then trade between ASEAN countries increasingly become loose. From these proofs then I dare to bet that the OG1 Asean business is legitimate and undoubtedly. The affairs of pulses products sold from Malaysia or Indonesia is another matter that can be temporarily put aside. PT. Sparkle. Sdn.Bhd officially operated in Indonesia Since April 2017 under the name of PT. Madani Patma Indonesia. Location of his office in Ruko Topaz Commercial Block B-8 Summarecon Bekasi. The business scheme that this company carries is multi-level marketing, as a product marketing concept that is based on the power of network development. This type of business scheme, very much adopted by leading companies, because it can reduce the operating costs of the company in the form of advertising in electronic media (eg TV) without sacrificing information on the products offered. There are many multilevel marketing models commonly used by companies in marketing the product, one of which is the binary concept as used by OG1 Asean. The concept is simple with a 2 foot pattern that can be lowered in stages indefinitely. For those who are able to develop this 2 foot model marketing network then, will be given a variety of bonuses with a lot of terms that sometimes make our tongue sprained when trying to call it. For me, any business scheme of its kind does not matter, which is important legitimate and able to survive throughout the life of the body contained. Talking about the price of pulsanya products, it certainly does not use the rupiah because the company origin Malaysia. 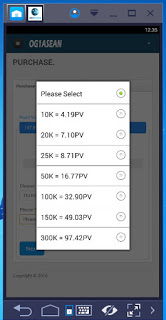 By the company made the point system as the principal price per type of pulse listed in the application when we have become a member. Then how much is the price of one point? let us know the price of pulse in rupiah units. Ifyour brain is smart enough and solid contains then you can actually see clearly and glowing opportunities to reap excess profits. But if still pessimistic, you should swallow it and hope there is money wad fell from the sky. To start this spectacular Asean OG1 business, the first step is to choose the amount of the pulse deposit. Remember the deposit that will be sent is a 1 year deposit, so there is no repeat order like the M-kios order model. Because the deposit is calculated for one year, the deposit will be returned to you every week for 48 times (1 year). Try to look again at the brochure listed above. 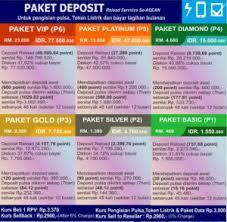 For Basic Package P1, deposit Rp. 1.550.000, then the deposit returned every week for 48 times is equal to RP.45.480. If the calculated then the total of a year to Rp.2.183.040. This means we have reaped profit of Rp. 633,040 despite not yet selling pulses and electrical tokens. For the next package (silver, gold, diamond, platinum, VIP) you can count yourself by using the same way as I showed earlier. My best offer, soon join do not think too long because this is a moment that can be your mount to get out of financial condition that really collaps.